The weather has turned for the worse, as the thermometer drops and morning frosts become the regular way to start a day. 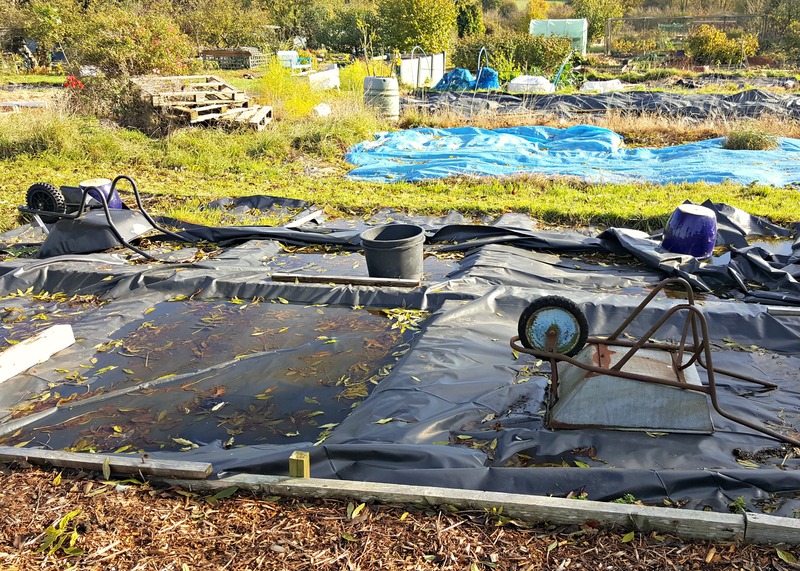 Across the land, empty allotment beds are finding themselves protected under a layer of tarpaulin to keep out the worst of the winter weather and prevent valuable nutrients leaching away. It’s a tried and tested method that’s benefitted gardeners for years. Nevertheless, I’ve always been reluctant, it’s something I’ve never done. Every year there’s always been a good supply of manure. 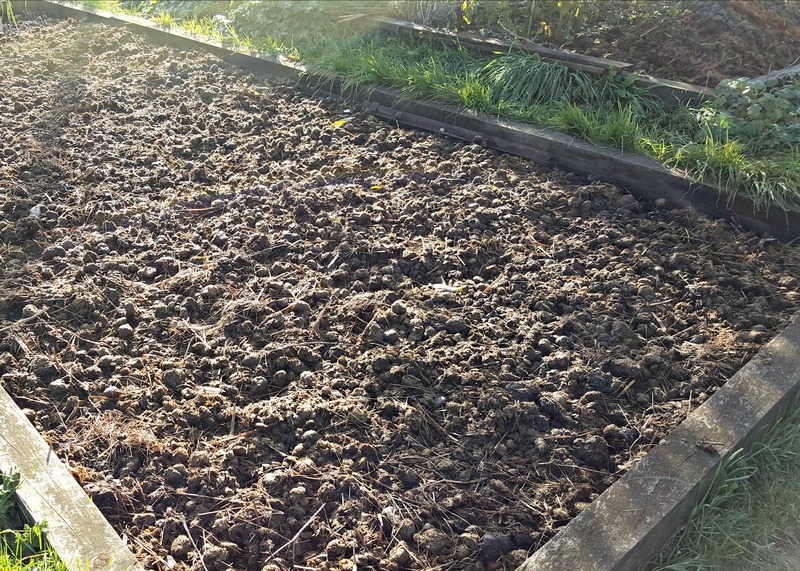 So after primary cultivation during the autumn, I cover my unused plots in manure and let nature work it into the ground over the next few months. Come spring, with a secondary cultivation, my soil is teeming with fattened worms, and is primed and eager to go. Another reason I’m reluctant to unroll the tarpaulin is that part of my autumn ritual is interwoven with my train of thought, and I like nature to be involved in this process. Strange as it may sound, I feel the extra nutrients from the manure along with winter’s harsh touch is Mother Nature’s way of blessing my little garden of Eden. Without it, I’ll anger the organic Gods, and my crops will be doomed to fail. I need this in my gardening calendar. When I first took on the plot nearly three years ago, it hadn’t been touched in years. The only thing they had done was to put a large sheet of tarpaulin over it. Uncovering it, I was faced with several large ant infestations, deep tap root weeds and slug warfare. Of course three years on, the allotment is very different. However, ants are a big problem and I really don’t want to encourage them back. I could put my hands in my own pocket and pay for a delivery of manure, but the problem is finding somewhere to put it. 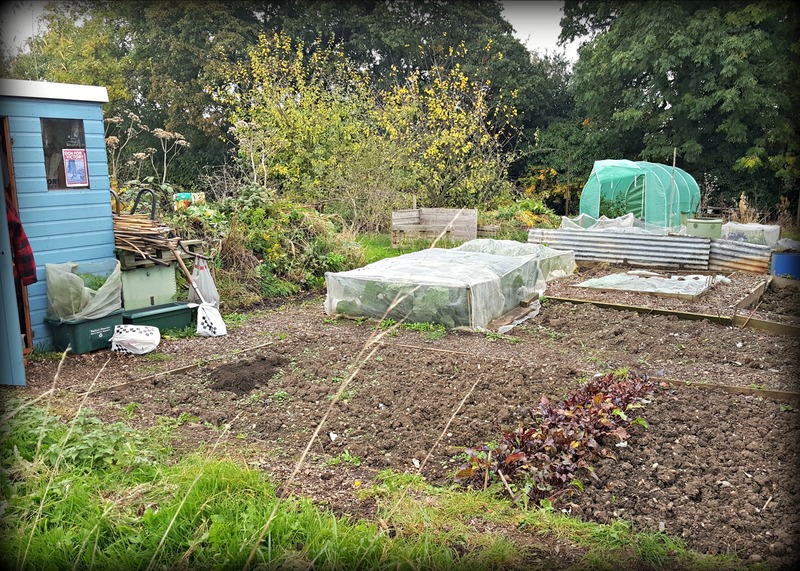 As my plot is at the back of the allotment, there’s no road access, and even if I was lucky enough to have the space, with just a whiff of manure in the air, my mound of joy would be desimated by the old boys and their bottomless wheelbarrows within minutes. These vultures stop at nothing! So for now, I’ll ride the odds and not do anything. I reckon I can still leave it a few more weeks before I have to make a decision. Hopefully by then, there might be a manure delivery. If not, I may have to re-think my options. 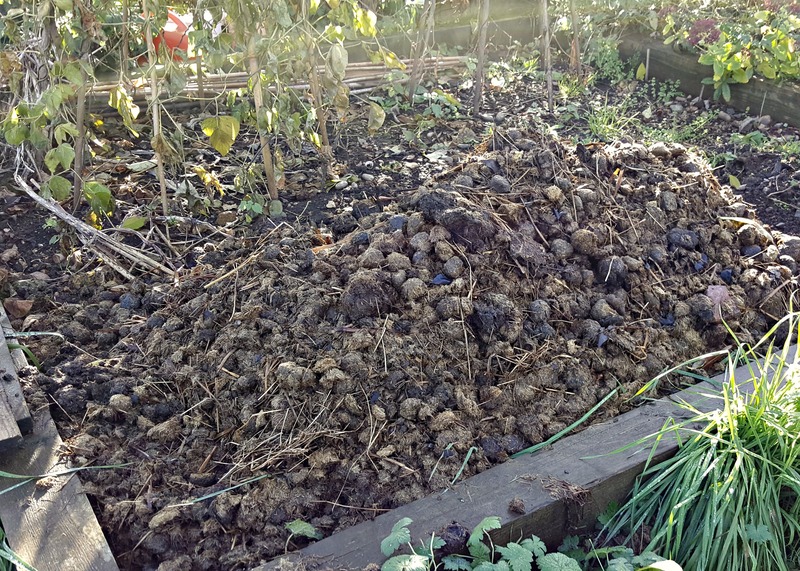 I’d agree that well-rotted manure is better – but I don’t have any yet this year. Also – I’m not planning to try digging in the green manure in Spring – too much effort – and it will take too long to break down in the soil. I’ll cut it down and add it to the compost heap. It will at least give the growing beds some protection over Winter – and as I’m growing Field Beans – should add some nitrogen. We”ll see next year – first time I’ve grown this. We have not covered our garden with a tarp for the winter. We usually mix manure, wood ash and bone meal to decompose into the garden on it’s own during the winter. Placing a tarp would deprive the ground of water. I too have wondered about all the organism,worm, insects and my frogs that winter in the rock wall of our garden. I have read a lot about planting red clover…. and other cover crops. I guess it is just up to the gardeners personal preference. I buy huge bags of horse manure from a stable. They are heavy but they get put in the boot of the car and from the boot to the plot in a wheel barrow. What about your compost heap? Can be weedy though but usually in a milder winter many of them germinate and can easily be dug in or hoed in spring. Also the soil from any pots and containers, that can go on top of your soil and is pretty much weed free, maybe it won’t go far but perhaps chose one bed to cover as part of a rotation. A more permeable layer such as cardboard may be a better bet than a tarp, stops the surface being battered smooth by rain but lets some moisture through.